Lima, Peru- Steep terrain, and rough roads contribute to motor vehicle crashes in the mountains of Peru. Responders use Rope Rescue to access and quickly recover victims. Team members from Albany Fire taught 11 different agencies Rope Rescue Basic. Ghana, Africa is located in West Africa and home to the largest natural lake in West Africa, Lake Bosomtwe. The members taught basic first aid, drowning emergencies, spinal emergencies, and CPR to the villages around the lake and near-by city Kumasi. The team took a trip to South America to teach basic Hazardous Materials education to the El Rosal Firefighters in Colombia. 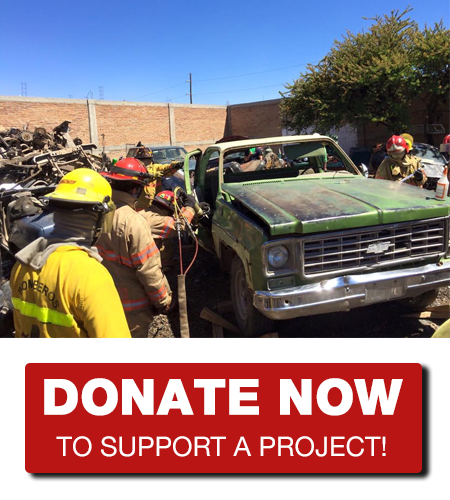 GMR has partnered with the firefighters in Colombia before and is currently planning trips back. Look for more HazMat classes being taught. Stuck with genocide, earthquakes, and economic ruin, Armenia is located in Central Europe where volunteers from GMR teamed up with the Peace Corps and Armenian Government to teach a week long first-aid and disaster management academy to local the local government, hospital, police, fire, and ambulance agencies. Global Mission Readiness’ training format is “train the trainer.” Meaning that we teach the students how to teach their peers the information that we are teaching them. That way our information has a broader reach. A typical class has 4-10 agencies from the region and 25-35 students. We facilitate cooperation and working together to make a difference in the communities.